eCite - Tectonic implications of fault-scarp-derived volcaniclastic deposits on Macquarie Island: Sedimentation at a fossil ridge-transform intersection? Tectonic implications of fault-scarp-derived volcaniclastic deposits on Macquarie Island: Sedimentation at a fossil ridge-transform intersection? Upper Miocene to lower Pliocene sedimentary rocks on Macquarie Island are dominantly volcaniclastic breccia, sandstone, and siltstone produced by the physical disintegration and tectonic abrasion of oceanic crust in fault zones and mass wasting of these tectonic features. They represent small debris fans and small-scale turbidites deposited at the base of active fault scarps, related to Late Miocene to Early Pliocene seafloor spreading. Most of the sediment is derived from basalts, but diabase and gabbro clasts in some sedimentary rocks indicate that middle and lower oceanic crust was exposed to erosion on the sea floor. A lack of exotic clasts and a low degree of clast roundness are consistent with a local source for the sediment and no input from continental rocks. Spatial relationships between sedimentary rocks and major faults associated with seafloor spreading on the island and correlation between sedimentary clast and adjacent up-thrown block compositions allow us to infer paleotectonic relief for Macquarie Island crust during deposition. Our data support a model involving the deposition of these rocks at the inside corner of a ridge-transform intersection. Furthermore, a tectonic reconstruction of the Australian-Pacific plate boundary for the approximate time that Macquarie Island crust formed (10.9 Ma) also shows that Macquarie Island crust most likely formed near a ridge-transform intersection. 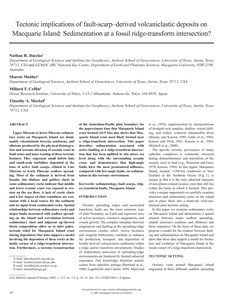 This paper describes sedimentation associated with active faulting at a ridge-transform intersection that has been uplifted in situ above sea level along with the surrounding oceanic crust, and demonstrates that high-angle faults have the most pronounced influence, compared with low-angle faults, on sedimentation in this tectonic environment.